This fund raising event is held at the Nevada City Elks Lodge at 518 Hwy 49 N in Nevada City. 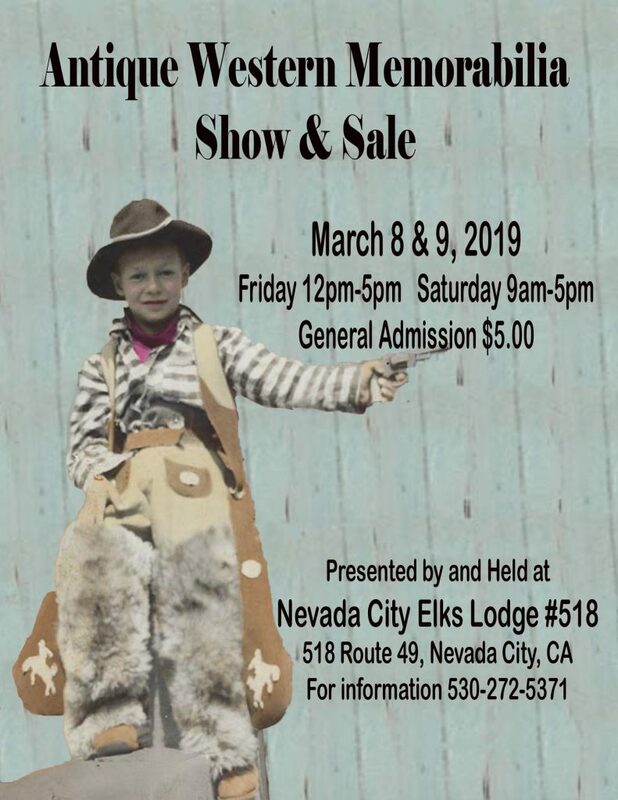 This will be our sixth annual Antique Western Memorabilia Show and Sale. This fascinating show features antique firearms, gold mining, railroad, gambling and western collectibles, including old bottles, coins, books, and Native American art and jewelry. This special event is for collectors, historians and those interested in gold country history. You won’t want to miss seeing the five foot high, thirty two foot long diorama of the City of San Francisco taken in 1878. Show hours are Friday, March 8th Noon till 5 PM and Saturday March 9th 9 AM till 5 PM. General Admission is $5.00 and children free accompanied by an adult. Early Bird entry will be $25.00 Friday only 9 AM to 12:00 PM.